At last Thursdays North Houston Greenspoint Chamber luncheon, members and guests heard of the tremendous growth that has occured in the northern sections of the area, and the problems this has caused for school districts that are trying to accommodate all the new students. As a result of this growth, the Aldine and Spring districts are planning on bond elections May 12th. Aldine will ask voters to approve $365 million in new bond financing, and Spring will ask for $280 million. Aldines superintendent, Nadine Kujawa, presented a slide show that exhibited over 10,000 new homes planned and under construction, with more than 5000 new students, that must be housed in classrooms in the near future. She said that since year 2000, the student population has grown to 59,000, with the addition of 6000 since then and another 5670 planned in the next five years. Many of these are now housed in temporary classrooms that need replaced, she said. Spring superintendent Dr. Ralph Draper said the situation in his district was even more dire. Although Aldine was facing a growth rate of about 10 percent yearly, Spring ISD has experienced a rate of 31percent in the last six years. This means that in the next 6 years, Spring must find room for another 12,500 students. The approval of the bonds will have a small effect on the taxes that property owners pay. If you have an over-65 exemption, it will not effect you at all. If you dont, Aldine residents can expect an increase of about 4 cents in 2007, and a total of 20 cents at the end of 2015. That translates to $2.62 to $15 per month increase for an average homeowner with a $93,500 house. In Spring, the taxes will decrease, according to the administration. The tax impact from the 2007 bond would be about 2 cents, they said. If the bond program is then approved, the projected tax rate for 2007-2008 would be $1.40, which is a decrease of 31 cents from the current tax rate. Aldines bond program is planning for the next 12 years, Kujawa said. A citizens committee studied the needs for 4 months, and made recommendations. Twelve new Aldine school buildings would include 4 EC/Pre-K centers, 2 elementary schools, 2 intermediate schools, 2 middle schools, 1 ninth grade school, and 1 high school. It would also include improvements and renovations to magnet schools, performing arts facilities, kitchens and other maintenance items. Also planned would be a new transportation facility, new busses, Air Conditioning for all 600 buses in the fleet, new safety and security systems, ADA compliances needs, and a field house renovation at Aldine High School. New magnet schools would be built on the east side of I-45, where they do not exist now. The new high school would be in the Greens Road, I-45 area. The bond program in Spring was studied by a panel of 70 citizens, Draper said. This study group worked for 4 months, and made recommendations for needs. This includes 6 new elementaries, replacement of Bammel Elementary, additions and renovations to Link Elementar, Ponderosa Elementary. In addition, new safety and security features would be added to a number of schools. Work would begin on a new High School #4, including land acquisition and design work. Westfield would be changed to a new middle school. A new transportation and operations facility would be constructed on Richey Road. 110 new buses would be purchased. Additional improvements would be made in technology infrastructure, improvements to many existing schools, and turf replacement at George stadium. Draper said that the bond issue will take the district into a next five years, or until 2011. In Spring, early voting is from April 30 to May 8, Monday through Friday, 7 a.m. to 5 p.m., and on Saturday May 5 from 8 a.m. to 4 p.m. Election sites are Anderson Leadership Center, Twin Creeks Middle School, and Claughton Middle School. On election day, May 12, voting is 7 a.m. to 7 p.m., at all elementary schools except Clark Primary. Close to 1,000 people attended memorial service for slain Nimitz High graduate Tynesha Stewart, whose life was short cut by violence last month. The service was held in the Nimitz High School Auditorium on April 14. During the service, Nimitz Principal Ken Kippel remembered Stewart as a student who was highly dedicated to her studies and who had plans for the future. During the service, memorial poems were recited and Gospel songs sung as friends and family mourned the loss of the 19-year old. Among those speaking was television news personality Linda Lorelle. Stewart was a 2005 recipient of a Linda Lorelle Scholarship Foundation scholarship. She was an engineering major at Texas A&M University when she died. Stewart was reported missing by family last month after she returned home for Spring Break. Witnesses say that Stewart was last seen at 4:15 a.m. on March 15 outside of boyfriend Timothy Shepherds apartment. Shepherd initially told police that Stewart left his apartment on foot wearing pajamas and carrying her cell phone. He later confessed to strangling her to death. Police believe that he then dismembered the body and burned the remains on his grill before dumping the remains in a trash receptacle. During a search of Shepherds apartment police found, among other items, 17 pieces of bone fragments and hair. Tragedy among tragedies!! This is the best way I know to describe what happened this morning in Blacksburg, Va. about 100 miles from my home. When I think of Virginia Tech, a university those of us in this locale are quite familiar, the thought that it would ever be the site of this nations historically largest shooting would never occur to me. A campus of 25,000 plus, Virginia Tech is a fine educational institute and is located idyllically in a small town nestled in the Blue Ridge Mountains in western Virginia. It is less than twenty miles from the southern West Virginia border and a couple of hours drive from our home. While it is off the beaten path for our usual travels, we have visited that campus on a few occasions in the past. My first trip there, years ago, was on a recruiting trip for Union Carbide Corp. Blacksburg is a beautiful town. Blacksburg is like many other towns that I can think ofState College, Pa., College Station, Tex. to name a coupleowes its entire existence to the school it carries in its bosom. Remove the school and the town disappears. Over the years I have had the pleasure of knowing a number of Hokie graduates and have one as my neighbor. I also know some youths in this area who are currently students at Tech. Usually I find myself in friendly discussions of the next WVU-Tech football or basketball game and chiding the loser at the end of the game. We are good friends and sports enemies. Now is not the time for that kind of banter as this fine school, and one of the best engineering schools in the nation, has taken a bitter hit. As I write this I am listening to the radio news that is reporting 32 or 33 dead and 25 to 29 injured. It truly is a tragedy among tragedies. By the time you read this the dead and injured count may be some different but not enough to make it less of a tragedy. We are hearing of these events much too often in this country and particularly on our high school and college campuses. It has to stop. I wish I could pick up the phone and call the authorities and say do this and the violence will stop. Unfortunately I cant and it appears others cannot either. How can we put an end to this and not give up our open social and governmental way of life? We have become a highly violent society while retaining our open and trusting system of living. My realist mind tells me we cannot stop this behavior if the shooter is willing to die for his actions. Our best will only keep these events to a minimum. I hope over the years my view is proven wrong. This will never be forgotten at Virginia Tech, Blacksburg, Virginia or in many other areas of the country including the southeast portion of West Virginia. It is a sad day here and I yearn for the time when I can go back to chiding or being chided by my Virginia Tech friends over a football or basketball game. Let is pray for Virginia Tech, the dead and wounded and the families of those impacted by these shootings. May it never happen again! Don Springer can be contacted at touchlife@worldnet.att.net. Went back home to the hill country for a few days; that is the foot hills of the Appalachia Mountains in Georgia. What takes twelve hours to drive took an hour and forty minutes from take off to landing. Of course it takes longer to get checked in at both airports. The line at the Atlanta airport was longer than a chow line at a military boot camp. Had to take off my shoes for screening and had to walk where thousands of others have walked either barefoot or stocking feet. Hope my tootsies dont rot off. much. The escalators are as steep as the hill behind my aunts house which is steep enough to break your neck. Got to see some people who have not seen me in fifty years; would not have known them if they came to the front door. Managed to get two bottles of Muscadine (2005) wine from my aunts stash. Cringed when the gal at the baggage check in line sort of tossed the suit case on the conveyor belt. Each bottle was individually wrapped in a sweat shirt and made it to Goose Creek. Asked around to a few ole boys who might know if there was any white liquor to be had, all of which is no mas in those hills this day and time…so they say. One said too many liquor stores around now days. Way back when, one could get white liquor, same as corn liquor and moonshine from six folks. All of whom are now long gone to their happy hunting ground. Speaking of, did manage to go by the cemetery where the folks are and numerous other friends and relatives. Always a sad venture indeed if you ever done such. Talked to some of them and felt good about it, thats all that counts aint it. Glad to be back home on flat land and in my own bed. Four Dog sho was glad to see me. 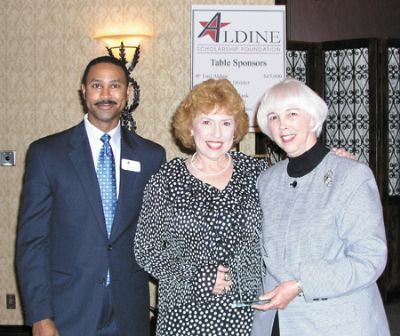 ALDINE It was great fun, as hundreds of well-wishers gathered at the Greenspoint Crowne Plaza Hotel last Thursday at an awards luncheon, to honor retiring Superintendent Nadine Kujawa as the 2007 Aldine Scholarship Foundation Community Star. This award has previously gone to well known educators and community leaders such as W. W. Thorne, Dr. John Pickelman, Mr. Sonny Donaldson, Aaron Glenn, and Jim McIngvale. The featured speaker at the luncheon was Commissioner of Education for the State of Texas Shirley Neeley. Neeley previously had been superintendent of schools for the Galena Park school district, and has been a friend and colleague of Kujawa for about 35 years. She mentioned the achievements that AISD has reached under the direction of Kujawa, including nominations twice for the nationally renowned Broad Prize for the best urban school district. Her theme was, To whom much is given, much is required. Her illustration of the point was Kujawas career in public service and education, and her achievements. Neeley also had some fun, joking about their common interest in ranching, and John Deere tractors. Also included in the program were proclamations from the city, the Greenspoint District, Harris County, State Senator Gallegos, and Congressman Gene Green honoring Kujawa for her career. These were presented by emcee Bennie Lambert, Foundation president, and AISD assistant superintendent Ben Wilson. Several speakers reminisced about the steps they took from Aldine schools to later success in life, including Armando Walle and Abel Garza. Garza spoke about how Aldine has given hope to those who have grown up underpriveleged. They thanked Kujawa and those teachers, some present, that had given direction to their lives. Kujawa is a native of Aldine, growing up on Hopper Road. She started her teaching career as an elementary teacher at Oleson Elementary. Lambert announced that a named scholarship had been established in Kujawas honor. Also attending the luncheon were her husband Harry, and daughter Christine, also an educator. The event, which is the main fundraiser for the ASF, drew a crowd of businessmen, individual supporters, and educators. The Aldine Scholarship Foundation is set up to generate perpetual funding for scholarships for the first year of college, to a graduate of one of the high schools in the Aldine district. Currently, the endowment totals more than $1,400,000 and each year over 50 scholarships are awarded. Endowments are encouraged, and start at $1000 and becomes a named endowment when the contribution reaches $15,000. Call 281-618-5440. Wet and cold this Sunday morning, not good weather for Easter services and especially the Easter egg hunt for the kids. Way back when, we had our Easter egg hunt out in the pasture. One did not have to worry about fire ants back then, thankfully so too. The prize to the finder would be a colored boiled egg or a hard candy egg; long way from the plastic egg with money and other goodies inside for kids this day and time. While using an instant messenger service, my cousin in Montana asked if I remembered the mean rooster that our grandparents had back then. She said it chased her across the back yard. Got flogged by a rooster one time, so I learned enough sense to stay away from those things and also learned to stay away from a hen when she had biddies. Walking home from the Saturday picture show, one would stop by the feed store at the bottom of the hill by the railroad tracks. That place had its own smell and had some nice saddles at times. Come Easter time they would have bright colored baby chicks for sale and that custom is still found today at some feed stores. Bought a baby chick for several years back then. Kept it in the bathroom in a box with feed and water. After the chick learned to jump on top of the box and get out, it was time for it to go and out to the grand folks farm it went. Never could tell my chick from the rest after it grew out of the colored plumage; Rhode Island Red if you savvy. Had a hen once that would jump and get a pinch of bread out of my hand. mean the fourth planting for the year. The potato tops are full and pretty if you admire such beauty in life as peppers, cukes, tomatoes and honeysuckle in the growth of spring time. A single Poke Salad stalk is tucked back on the south side of the house by the fence. That stuff comes back each year on its own and has since I planted some berries about 8 -10 years ago. Poetry is something I have enjoyed all my lifepoems done by the national/international masters and local or state poets. There always seemed to be a freshness of a new poem that felt good as I read it. Like everything else some poets make worldwide names for themselves: James Whitcomb Riley, Eugene Field, Clement C. Moore and Henry Wadsworth Longfellow, to name just a few. I have long enjoyed their work. A number of local, yes and far lesser known, poets come forth every day hoping to have the success of those listed above. Most never get beyond writing verse for themselves, their family and friends, or perhaps being published in the local newspaper or magazine. Nonetheless I have found myself reading and enjoying many of these local poets. Over these past dozen or so years I have published a few local works as part of my column. However, I dont believe any have ever appeared in the Northeast News. Perhaps someday Ill change that. But for today I choose to stay with the masters. I was given a copy of an old weekly newspaper from the early 1980s. This paper comes from a small, rural village, not unlike small rural villages across this land. The newspaper is as those found in many of these villages as they all have a sameness, yet a freshness as well. The village, town, county or state seems to matter little, but these small but important papers stand out. In The Book Bank November 29, 1982, which I hold in my hand, some four pages of this 24-page issue are devoted to poetry. One of these pages has a few poems penned years ago by Eugene Field. I read them all with pleasure and they brought a smile to my face as I read. One of those, Wynken, Blynken, and Nod I well remember from my childhood. I hope you do as well. Wynken, Blynken and Nod, one night/Sailed off in a wooden shoe,/Sailed on a river of crystal light/Into a sea of dew,/Where are you going, and what do you wish?/The old moon asked the three./We have come to fish for the herring fish/That live in this beautiful sea,/ Nets of silver and gold have we!/Said Wynken, Blynken and Nod. The old moon laughed and sang a song,/ As they rocked in the wooden shoe;/And the wind that sped them all night long/Ruffled the waves of dew./The little stars were the herring fish/That lived in that beautiful sea/Now cast your nets wherever you wish,/Never afeard are we!/So cried the stars of the fishermen three, Wynken, Blynken, And Nod. All night long their nets they threw/To the stars in the twinkling foam,/Then down from the skies came the wooden shoe,/Bringing the fishermen home:/Twas all so pretty a sail, it seemed/As if it could not be;/And some folk thought twas a dream theyd dreamed/Of sailing that beautiful sea;/But I shall name you the fishermen three: Wynken, Blynken and Nod. A three-alarm fire destroyed a local tire disposal shop last Thursday, that has previously been the subject of neighbors complaints and investigation by authorities. Both the Harris County Sheriffs office, abatement officer, and the states TCEQ have been involved in these investigations and complaints. The shop had been in the process of removing some inventory, and attempting to meet county and state regulations regarding tire storage. Westfield Road Volunteer Fire Department Chief Gary Vaughan Jr. said that when they rolled up on the Mt. Houston Tire Disposal at approximately 5:30 a.m. the shop was 90% involved in flames. Mt. Houston Tire Disposal was located on Mt. Houston Street, two blocks east of Hwy. 59. Realizing that the shop was a loss, Vaughan said their primary responsibility was containing the blaze and not allowing it to spread to a residential structure just yards from the back of the shop. This job was complicated by a lack of fire hydrants in the area. This need required the assistance of other departments. At least two other departments, Aldine and Houston, brought tanker trucks of water to help fight the fire. It is very important to have fellow departments with tankers to provide assistance, Vaughan said. When not fighting fires Vaughan said that the departments often train together. 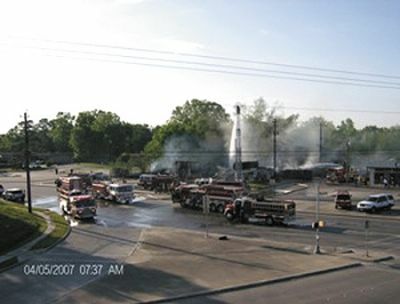 Because of the tires in the shop, the fire also presented an environmental concern, which required the expertise of the Harris County Hazardous Materials unit. Bob Royall, with Harris County HazMat, said that there was little exposure to toxins from the fire. Typically when petroleum-based products like tires burn they produce a heavy black smoke. Since there was little wind, he said, the smoke drifted straight up. Remote air monitors, however, were place around the site to collect data on air pollutants. Inside the structure, Royall said, they found several acetylene and propane bottles used in welding. These were compromised by the fire and were removed to ensure firefighter safety. Royall praised Westfields effort in keeping the fire from spreading. He added that several of the firefighters had attended a tanker training program at Texas A&M Universitys Fire Training Academy last weekend where they worked on this type of scenario. Harris County Chief Arson Investigator Daniel K. Given said that as a matter of protocol an investigation would be held, although it would not be easy. Witnesses to the early condition of the fire mentioned that multiple sources could be seen burning, rather than spreading from one location. In a typical fire case specially trained dogs are brought in which can detect the presence of accelerants or chemicals like gasoline that might indicate arson. However, due to the nature of the business they would expect to find all kinds of accelerants in the business. Given said that they know the fire started in the back of the building, but that as of press time they didnt have any other additional information. The Aldine ISD is asking the patrons of the district, on May 12, to approve $365 million in schoolhouse bonds, which would, among other projects, build 12 new schools buildings. Over the next few weeks the district has planned a series of public meetings to explain the purpose behind the bonds and the impact they would have on taxpayers. Meetings will be held on April 10 at Carver High School and Keeble EC/Pre-K. On April 12 there will be meetings at Aldine High and Grantham Academy. Three meetings will be held on April 23: at Carver High, Hill Intermediate School and MacArthur High. On April 30, there will be meetings at MacArthur and Nimitz High Schools. Nimitz will host another meeting on May 1. The final meeting will be May 3 at Plummer Middle School. All meetings will begin at 7 p.m. According to the district, they have reached the limits of their current buildings. In the past seven years, the district had added 6,000 new students bring the total close to 59,000 students. Close the 6,000 students are being taught in temporary buildings. A study of the district shows 10,625 new homes are either being planned or are under construction and another 6,000 additional students are expected of the next five years. In addition to building new schools, the district also plans to spend $75.6 million on improvements at its other campuses. While passage of the bonds would cause an increase in property taxes, the district says the range of the increase is modest by comparison to the benefits. The average property owner could see a monthly increase between $2.62 and $15 depending on the amount of bonds sought that year. Under state law, property taxes will not go up for homeowners who are over 65 or who are disabled. Early voting begins April 30 and lasts through May 8. The Leadership North Houston Alumni will participate in a community service project with the Aldine Y.O.U.T.H. Community Center, 4700 Aldine Mail Rt., on Saturday, April 21st from 10am  2pm. A Community Day is planned to include a large yard sale in conjunction with the Aldine YOUTH Renewed Blessings Resale Shop, a fun carnival for area youth, and an outreach to the surrounding community by forming groups with the teens involved in the Youth School of Business Program. They will distribute important information about the many educational, vocational, social, and recreational activities available at the Center for residents of all ages. Leadership North Houston is a community based leadership program, committed to educating and enhancing the involvement of existing and emerging leaders of north Houston. Aldine Y.O.U.T.H.s mission is to empower positive change in the lives of our youth and their families through partnerships with businesses, agencies, schools, churches, and talented volunteers. This event merges the goals of both organizations to the benefit of the community. The goal of this project is to improve the awareness of the Aldine Y.O.U.T.H. Community Centers programs, increase the sales of the Resale shop which helps to financially support the Centers programs, and to host a fun and educational event for community families. A group of students from the University of Houstons Graduate College of Social Work will be providing resources and information to the community, based on the results of needs assessment research conducted in the surrounding area. Sylvia Bolling, Executive Director and Founder of Aldine YOUTH says, We truly appreciate Leadership North Houston coming out to be a integral part in helping us to increase our capacity to serve the many low-income families. Community events like this help us to help our youth become healthy, self-sufficient members of society. It does take a village to raise a child and to make a sustaining difference. Please contact the Aldine YOUTH Community Center to make a tax-deductible donation of items for the Resale Shop and for this event. For more information, call 281-449-4828.